When Bayo Omoboriowo, the restless Personal Photographer of President Muhammadu Buhari, barged in on the President requesting to have his picture taken as he watched the match between the Nigeria Super Eagles and the Indomitable Lions of Cameroon, it certainly didn’t occur to him that he was opening a window to the world on the facts of life of a man who is singly responsible for the 2015 victory for the All Progressives Congress, APC. Bayo said to me that it was the best picture of his short professional career. President Muhammed Buhari has been known to be a disciplined retired military General who lived a simple and austere life devoid of ostentation. He is not known to have the common vices associated with politics and politicians. He does not smoke or drink alcohol. He didn’t belong to rich or royal families. He is known to have grown up with an enthusiastic desire to serve and his choice to serve in the army was not, therefore by accident. Even at 74, Muhammadu Buhari is known to enjoy a better health status than people much younger until of course, the recent bout of illness from which he recovered. I think the reason that Bayo wanted to have that picture was a burning desire in him, and in all of us, to show that the President is well again, and has resumed his normal life. 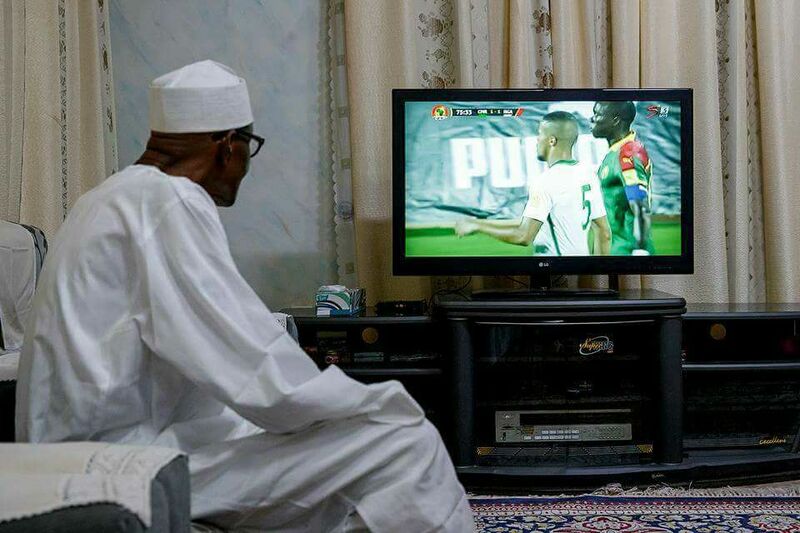 What a majority of Nigerians saw in that picture was a lot more than that. The many who saw those images and shared them to millions of others on the social media with their comments, is a major revelation of the lifestyles of this spectacular public figure that has changed politics in Nigeria and Africa for good. They gave all sorts of interpretations to the TV set, the TV stand, the curtains, chairs and about every item visible to the eye in those pictures. The images also had the effect of projecting the popularity of the President in the social media. From our official channels on Facebook, including that of the President, the Special Adviser, Femi Adesina and my own, we had thousands of comments and shares. We equally had a bountiful number of replies, tweets and re-tweets on the tweeter. More than 80 percent of all these were positive. Musa Garba Bawa @khalamuddeen: “PMB all the way, no shaking 2019 In-Shaa-Allah. Mal. Garba Shehu continue the good work we are 100% in support. Let Super Eagles win”. Adamu Kassim @Kasimupro: “Truly this man is a leader. I will sell my TV to buy something like this”. Femi Fakolade @femikolade “We brought nothing to this world and we shall go with nothing”. Badong Joshua @Joshua_badong: “This alone shows how caring and all inclusive leadership style of our President”. Thywill Mac Diri @MacDiri: “This TV is 32″. This man is a simple pal”. Adamu Bashir Njobdi: “If I wish to be a local government chairman, my living room will be far better than for the current president. May Allah continue to bless and give my president sound health. #PMB till 2023”. I have two narratives to add to these positive sentiments. One, in the course of the campaign, I remember the then candidate Buhari being ushered into a lavish guest house of a serving Governor. Each of the single seats was as big as a settee or a bed, if you like. President Buhari jocularly commented that the chairs alone have filled up the room: Why this big? Two, many may recall that when he gave out his daughter in marriage sometime last year, the President ruled out the use of government funds in all of the activities. His reason was that this was a private, family event and should be kept as such. And so it was. A country struggling with its economy should consider herself lucky with a leader who husbands state resources as prudently as he does his personal resources. All politicians have their selling points. For President Muhammadu Buhari, it is his simplicity, honesty, incorruptibility and personal integrity. Let the naysayers dispute!